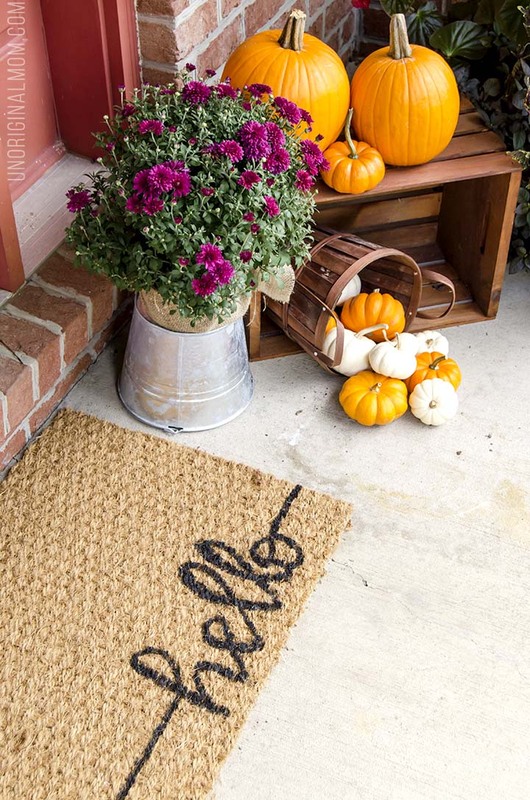 TIP #1: Start with pumpkins and mums. 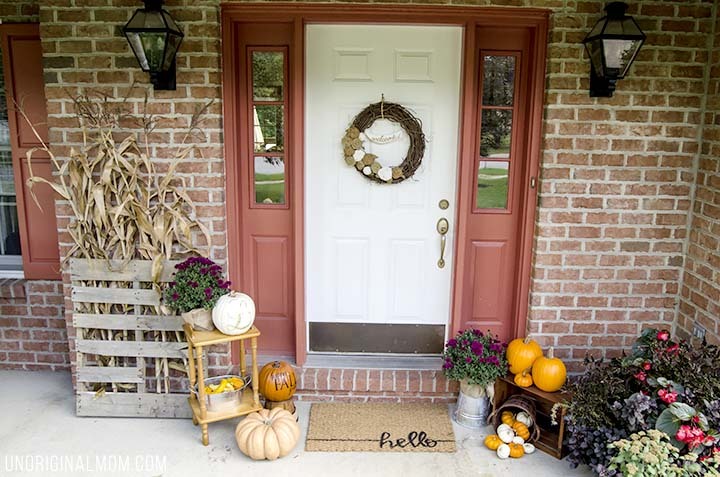 The most important elements to any fall front porch are pumpkins and mums! It doesn’t get much more “fall” than that. And you can’t go wrong! I like to mix and match all shapes and sizes of pumpkins. TIP #2: Vary your levels. Use planter stands, upside down buckets, baskets, crates, etc. to add some variation in height on your porch. Otherwise you’ll just have a bunch of pumpkins on the floor! 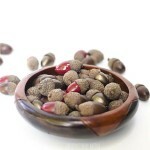 Use them to creatively display your pumpkins, mums, and other elements. If you have steps leading up to your door, use them. No need to go out and buy lots of new things, though. Shop your garage to find what you need – you’ll be surprised what you have already laying around. 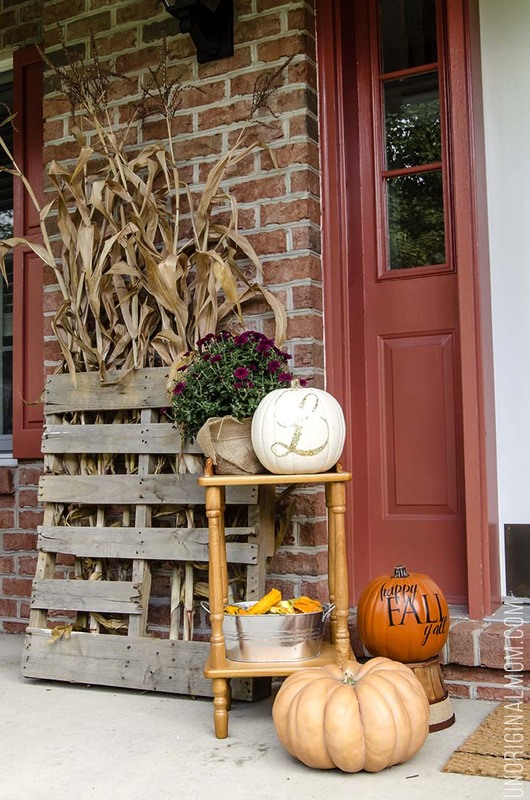 TIP #3: Add some other rustic elements and fall decor. Use what you have and be creative! I’ve had this broken pallet sitting underneath the deck for a year now…it was in a pile of other pallets that have all been broken down for various project, and this was the reject that wasn’t even good enough for that. But it looks great holding up some corn stalks on the porch! It’s just the thing I needed to add some height and texture. And I didn’t have to do a thing to it! I also added a galvanized tub (that I’d turned into a planter a few years ago) and filled it with gourds. I had to come up with another creative solution to cover the black plastic buckets of my grocery store mums. I could have bought a few nicer planter buckets, but I didn’t want to spend the money. Burlap to the rescue! I just grabbed some scraps from my stash, cut out squares big enough to wrap around the bucket, and tied it up with some jute twine. 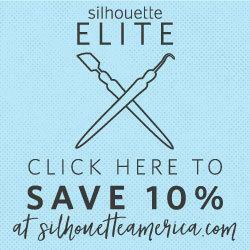 Easy peasy – and it didn’t cost me an extra cent! 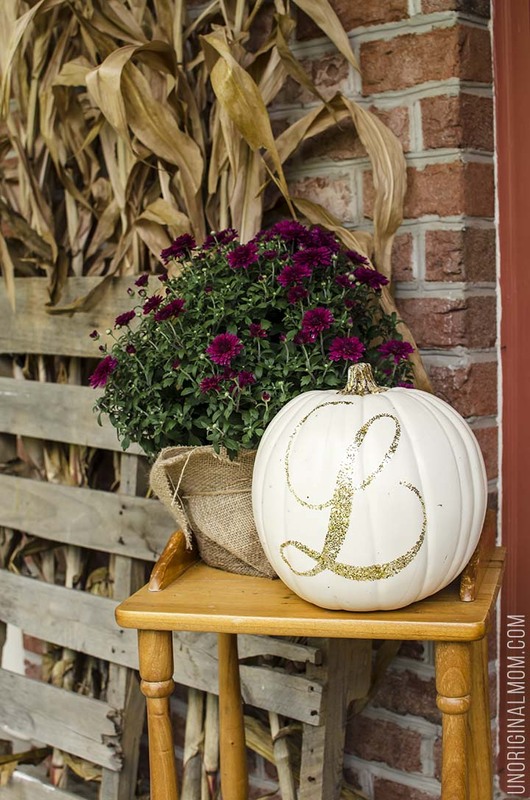 And of course I had to give my glitter monogrammed pumpkin a prominent spot on the porch – it’s one of my favorite fall elements, and one of my most popular tutorials ever! 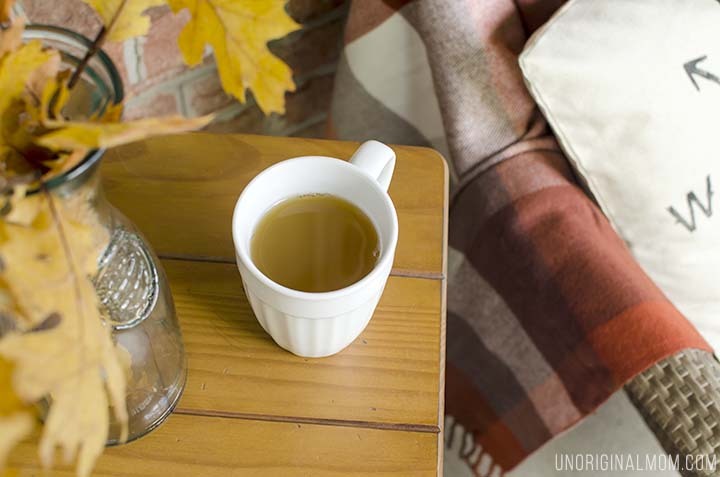 Tip #4: Create a cozy and comfortable seating area. 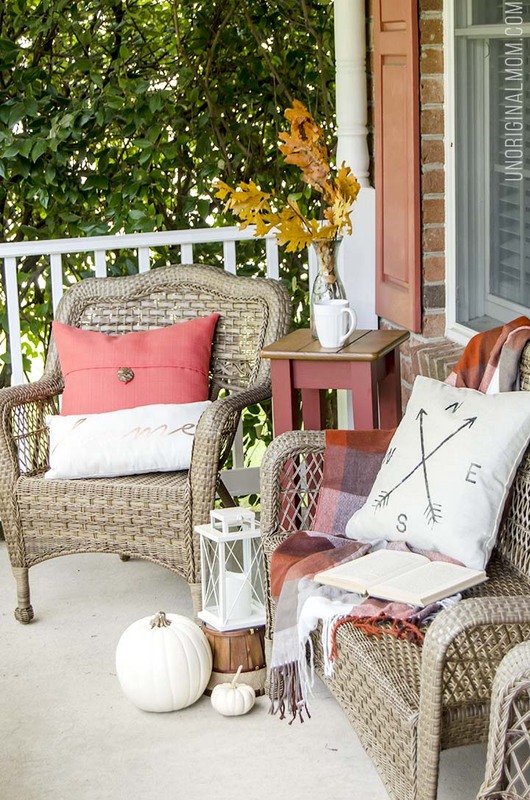 Here’s the second part of our cozy fall front porch – if you turn left from our front door, this is what you’ll see! Tip #5: Make it something you love. 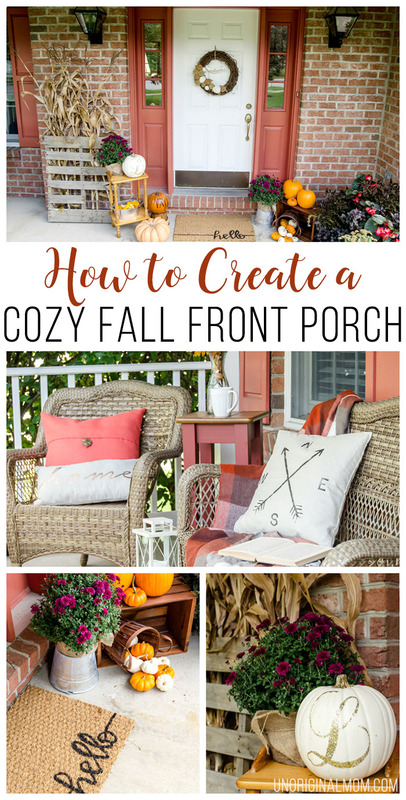 The most important tip I can give you for creating your own cozy fall front porch is to make it into something YOU love. Don’t compare it to mine, or to your next door neighbor’s, or to the magazine-perfect pictures on Pinterest. 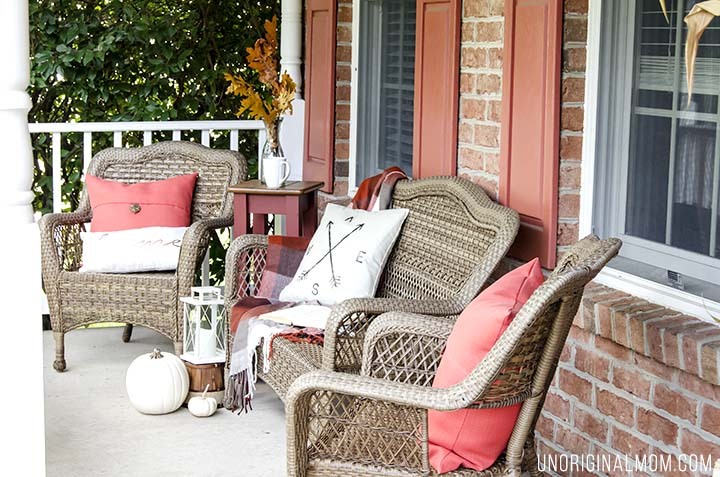 Make it a space that draws you outside on warm fall afternoons to just sit and admire the autumn colors or watch the kids play. If it feels warm, comfortable, and welcoming to you, that’s all that really matters! 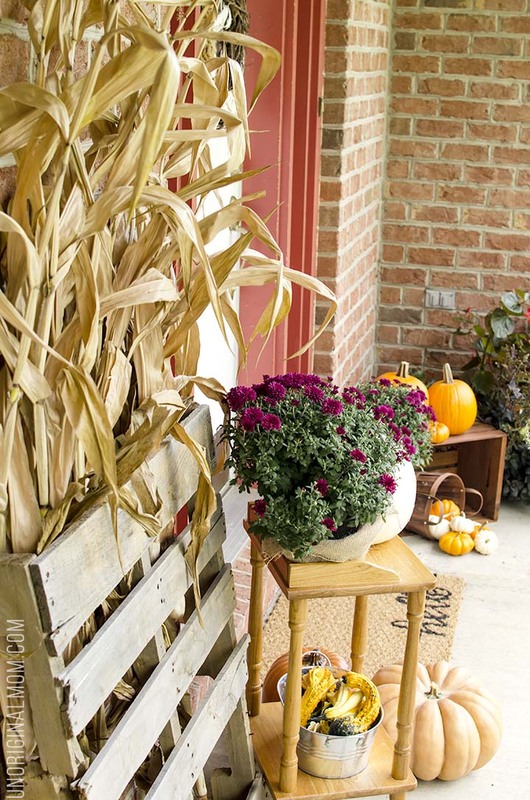 Do you decorate your front porch for fall? What are your favorite elements to include? The porch looks great! 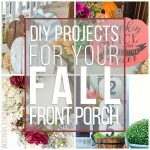 I will definitely be using these ideas next fall when we are in our new house! That’s beautiful! 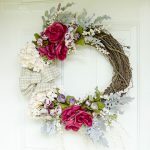 Can you post a close-up of the wreath on your door? Hi Angelica, I’m sorry I don’t have one! So silly of me not to take that photo, but this was last year’s front porch. I love your front porch! The color of your trim on your house is very pretty! Thank you for all of the ideas!